Chord theory is something I often teach to adult beginners in the early days – even if you don’t have much experience, having a good understanding of chords and chord theory can make learning all kinds of pop songs easier (like when you look up chords to some tune on the radio). But it can also make learning classical music easier as well – most post-baroque pieces use chords or chord progressions in one form or another. Also, the end of this video includes an ear test, which I will provide the answers to below. What is a major chord? So what is a major chord? Well if you’ve been following the videos, you’ve learned a couple already – like C major, F major, or G major. Let’s look at what they all have in common. 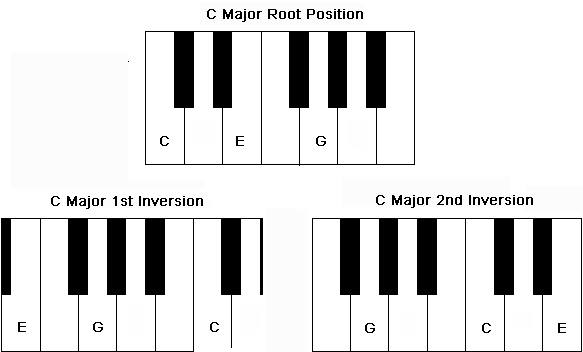 When I play a C chord in root position, every chord’s home base, the bottom note is a C. this bottom note determines the name of the chord. This shape is very important: 1, 3, 5. I can rearrange the letters of a C chord to, say, E, G, C, and it’s not like it would transform into an E chord, because now the shape is different, it’s 1 3 6 instead. So that’s why this (1, 3, 5) is called root, or as I like to call it, home base. It tells us what we need to know about the chord. So now let’s shift our discussion to the SOUND of the major chord, the tone. They all have the same overall tone, or mood to them. To me, major chords sound bright, happy, positive. Now for minor chords. To make a major chord minor, you just slide down the third, or the middle note – you lower it a half step. So 1, 3, 5 would become 1, b3, 5. Or C major chord at C, E, G would become C minor chord at C, Eb, G.
Now to explore the overall sound and mood of a minor chord. To me, they sound dark, sad, sombre. When you know the difference in sound between major and minor chords, you can figure out any chord you want. If you’d like to see some keyboard examples, check out the video for a more in-depth look (as well as the ear quiz at the end). There are many different types of chords out there in the music world, but major and minor chords are the foundation chords, and probably the most important ones to know as a result. Enjoy figuring them out, as well as the ear quiz!